Feb. 23, 2016 - Polar bear cannibalism likely isn't a rare event, but it's rarely witnessed by people. This may be the first time it's been captured so well on video. During a Lindblad Expeditions trip on the National Geographic Explorer in the Arctic, crew and passengers spotted a male polar bear hunting and then eating a polar bear cub, despite the efforts of the cub's mother to protect it. Experts say this cannibalistic behavior could be occurring more regularly, because the loss of ice due to climate change makes it harder for the bears to get to their typical food sources. 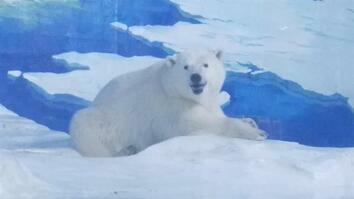 Click here to read more about Polar Bears. 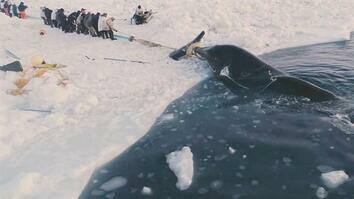 Blood on ice in the Arctic is not a sign death, it’s an affirmation of life. For me it was like in the Arctic, it was the hunt. 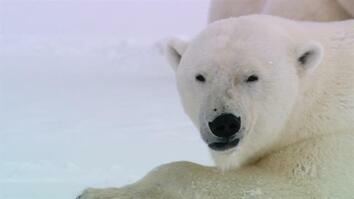 So the polar bears are currently here on the sea ice, looking for seals, their favorite food. Now here you see the female and the cub running as fast as they possibly can, now you can barely see that but the only thing that would make a female run like that is being threatened by an adult male. Normally the males don’t chase them particularly, the females are very fast but when they’ve got a little cub with them like that, they run more slowly. And so it’s possible for a male to catch up. Unfortunately the male was just gaining on them the whole time, the cub was falling back, and at one stage the mother turned and try to defend but the male basically ran straight past her and in the end the cub diced into a little pool and the male was in straight after. The female actually jumped in there as well but it was all too late. The male had the cub. The loss of a cub is very traumatic for her, but the important thing is for her to save her own life, and she quickly changes from being a bit defensive of her cub and trying to protect it, to realizing that there’s no longer any hope and the best thing for her to do is to leave and get as far away as possible as soon as possible. To witness something that is obviously just normal in the life of a polar bear, but for all of us, being seen the first time just off the ship, I think was very very emotional. Certainly it was very hard to look away. I watched the entire scene through my binoculars. But it was painful to see that, I mean sure, you understand that this is life in the Arctic and this sis something we know about polar bear biology. But to see it is really dramatic. In the late summer like that you don’t see very many seals up on the ice in these open areas, so the amount of available food for a polar bear is quite reduced. One of the only things that is left to eat is in fact cubs of various ages. The footage itself is quite rare, but the event probably isn’t. It’s likely something that will occur as more and more ice melts through climate change, and food becomes less readily available to polar bears on the ice.